These sounds cards have the spellings for each sound. 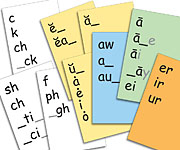 Use this set of 3x4 cards to review the spellings for each sound. Great learning aid to use with Phonics By Spelling pictures and music.